Today the CBI commended members of the teaching profession for single-handedly turning around the ailing retail economy leading to one of the best start to February in recent years. "The keenness with which thousands of Head Teachers up and down the land are able to seek out a snowflake and the speed with which they can close a school has brought a welcome boost to the Shopping Centres of the nation," said Sir Digby Billingsworth of the CBI. "Their dedication to leisure is a great boon to hard pressed retailers whose shops are now full of teachers." "You can’t move for teachers at the moment," said a Starbucks employee at one of their outlets in the Bluewater shopping centre in Kent. "They are sitting here with travel brochures out planning what to do with their ten weeks holiday." The National Union of Teacher’s defended its members’ decisions to close schools saying that no one took them lightly, but that it was in the best interests to close the schools immediately after the weekend. "The schools are closed for safety reasons, why risk children’s health on slippery playgrounds? By keeping them out of school they can throw ice at each other and toboggan down motorway sliproads instead," said a spokesman for the Union. "Of course this causes problems for childcare for which our members get grief, but it is a no-win situation. 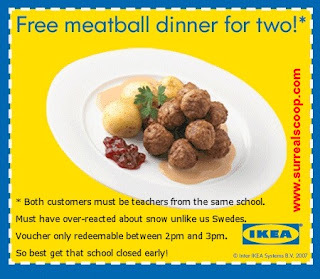 If we don’t close the schools the head teachers get it in the neck from their spouses unable to get to Ikea whilst it’s quiet." Many teachers said that the closures had played havoc with their own plans for the week but they were confident that the disruption could be absorbed in the rest of the schedule. "I am hopeful that my Sky Plus box will record the rest of ‘Loose Women’, because I hadn’t seen it before and it was quite good," said a teacher from Eltham, South London. "And that Jeremy Kyle programme is crazy!" Staff at Watercliffe Meadow ‘Place for idiots to pretend to be teachers’ said that they were using the inclement weather as a teaching aid. "Obviously we don’t call it snow, we tell the children it is ‘flakes of the sky’s inhospitableness’," said Linda Billingsworth, head teacher. 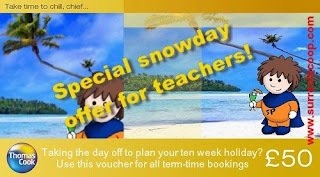 "In science we are helping the children explore their feelings for winter,"
Geography teachers up and down the country, apart from Watercliffe Meadow where they are known as "Earth Mother Physiography Emotional Guides", now post regular snow reports to Twitter subject #cantBeArsedTodayIsItSnowingAnywhere.